I was going to make a purple skirt for myself, but my little one put in a special request for a purple skirt, and...well...how could I resist? The skirt is a little heavy, which will be a good thing when fall/winter sneaks up on us. A pair of tights will keep the little shooga booga warm. The skirt has two layers, the bottom polka dotted layer is a medium to heavy weight fabric and the top car layer is a linen and cotton blend fabric. The top of the skirt is serged with a 3 thread rolled hem overlock stitch and the waist band has elastic for a perfect fit. Seriously, this skirt is very easy to make and you don't need a serger to make it. Similar to my previous skirt I made, I based the pattern on the the Country Charm skirt featured in the Sew What! Skirts 16 Simple Styles You Can Make With Fabulous Fabrics book. I may have written this before, however it's worth mentioning again...I really like this book! I find it inspiring and a great resource to have on hand. There aren't any paper patterns in the book. Instead, the book teaches you how to take your own measurements and draft a pattern with them. Very freeing and rewarding! 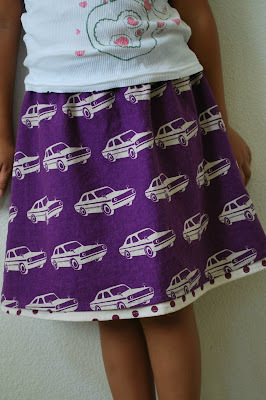 I still may make a purple car skirt for myself. If I do, then my daughter and I can be twins. As she grows older, I'll make another one her size, and I can continue to make the purple car skirt in her size all the way through College. Won't that be fun?! BFF's 4ever ;) Ok...I'll stop at jr. high. The little bitty ditty is so cute and retro at the same time. 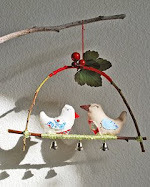 Thanks for mentioning that resource book again, I am going to check our local library for it. You are encouraging me to try my hand at sewing stuff.